There is no doubt that you must wander the ruins of Rome to appreciate the history that has unfolded there, and stroll the crooked alleys of the historic centre and Trastevere to immerse yourself in the city it is now. But sometimes it is only when you look down upon a city from a higher point that you can really absorb its magnificence, and Rome, with its horizon of glittering domes, is the perfect place to do just that. 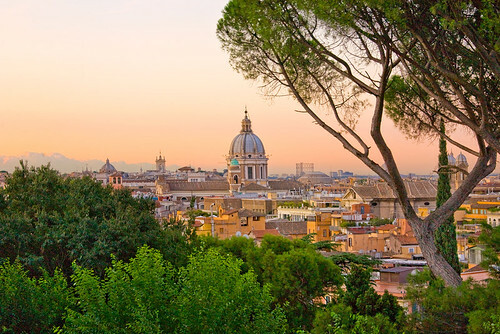 Luckily, there are many places in Rome to enjoy the city’s skyline, whether sipping an espresso from the terrace of an ancient fortress, or lying in the shade of an orange tree in a hilltop park. Here are our favourite spots to take in Rome in all its grandeur. Halfway up Via di Santa Sabina, on Aventine Hill, there lies a little garden. In Parco Savello, known to Romans as Giardino degli Aranci (the Orange Garden), a row of orange trees leads the eye to the terrace at the edge of the hill, beyond which, the dome of St Peter’s rests grandly above a jumble of terracotta-coloured roofs. Approach the terrace and all of Rome appears to open up before you, with palatial villas lining the Tiber River in the foreground, and Rome’s many domes receding into the distance. Travel a little further up the hill and you’ll come to the Piazza of the Knights of Malta, where, through an inconspicuous keyhole, a perfect view of St Peter’s dome is framed. 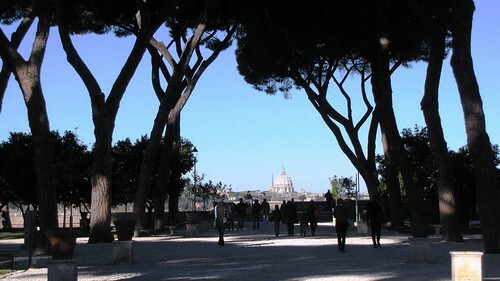 Janiculum, or Gianicolo in Italian, can be reached either from climbing the hill from the labyrinthine lanes of Trastevere, or from the flight of steps leading from near the Vatican. Either way you ascend, you’ll be met with a view that is inarguably known as ‘the best in Rome’. Here, the city can be viewed in one impressive panorama: from the imposing fortress Castel Sant’Angelo, to the bronze wings of Victory atop the Vittorio Emanuele II monument that soar above the surrounding buildings. At noon every day, you can hear the sound of the midday canon – since 1847 the canon was used as a reference point for the surrounding bell towers so that all the church bells would sound at the right time. It dominates the Roman landscape from any other vantage point, but the view from its own terraces is not to be missed. After exploring its lushly-decorated Renaissance apartments, enjoy a coffee from the cafe in the castle ramparts. Although not as high as other viewpoints, the roof of Castel Sant’Angelo delivers close views of Rome, such as the Ponte Sant’Angelo crossing the River River, linking the fortress with Rome’s ancient streets. In the afternoons, the sun sets behind St Peter’s dome, spied perfectly through the rampart windows. The second-century fortress has been immortalised in romantic and popular culture – its dungeons formed the lair for the assassin in Dan Brown’s Angels and Demons, and the terrace featured prominently in Act III of Puccini’s Tosca, in which Tosca leaps to her death from the parapets upon learning of the death of her lover. This majestic marble building, less-than-affectionately known as the ‘wedding cake’ or the ‘false teeth’, due to its garish white appearance, is a monument to the inauguration of the first king of unified Italy, Vittorio Emanuele II. The site, from its height on Capitoline Hill, has become a popular spot for visitors to take in the panorama from its roof. For €7, take the glass elevator to the Terrace of the Chariots (Terrace delle Quadrighe) to experience ‘Rome from the Sky’. From beneath the wings of Victory (the same you spied from the top of Janiculum), you’ll enjoy a 360 panoramic view of Rome taking in St Peter’s, the Roman Forum, the Colosseum and everything in between. 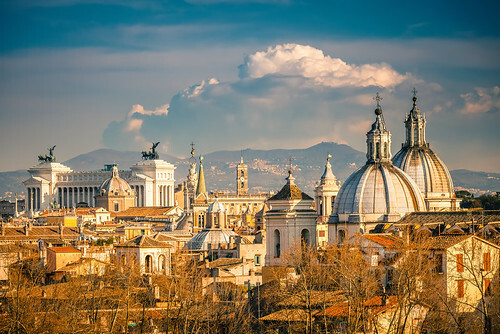 Explore Rome from all its vantage points with this week’s deal of the week: Rome City Break, 3 nights from £199 including airfare. Lauren Rayner is Social Media Specialist at Flight Centre UK. Find her on Twitter here.